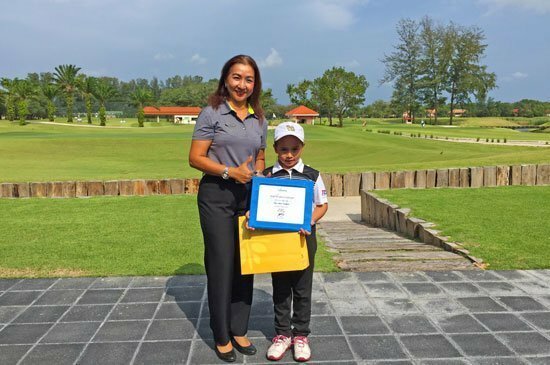 6-year old Louise Landgraf celebrates her ‪‎hole-in-one‬ at the par 3 hole #8, pictured receiving a special certificate and prize from Club Manager Walaiporn Pattamavichitvong. 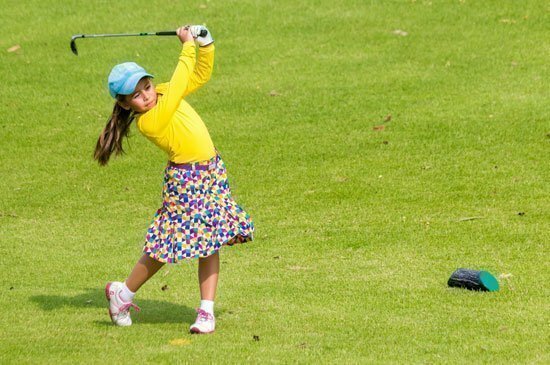 Laguna Phuket Golf Club recently celebrated an extraordinary achievement when its youngest member, six-year-eight-month old Louise Landgraf made history as the youngest golfer ever to achieve a hole-in-one around the newly upgraded golf course. As Landgraf approached the red tee of the 108-yard 8th hole, she had no idea that she was about to walk into the Club’s history book. Sending her ball flying high towards the green, Landgraf watched on in delight as it disappeared into the hole for an Ace! Last July, representing Thailand in her first time at a world junior event, Landgraf had participated the IMG Golf Junior World Championships held in San Diego, California and finished overall 4th in the Six and Under Division. Louise Landgraf showed her swings at the upgraded Laguna Phuket Golf Club, during its 1st Junior Golf Tournament, held on Sunday 21 June 2015. Aside from being a member at Laguna Phuket Golf Club, she also practices daily and is trained by Pro Tien and Pro Punk from the Dragon Kids Golf Academy in Phunaka GC, Phuket. Junior Golfers 16 years and below can now enjoy Laguna Phuket’s upgraded golf course at THB 870 for 9 holes or THB 1,560 for 18 holes. The new junior rates are valid through this high season until 31 October 2016. For more information on junior golf information at Laguna Phuket Golf Club, please contact 076 324 350 or golf@lagunaphuket.com or visit lagunaphuketgolf.com or facebook.com/lagunaphuketgc for more info about the course.